More than Goulash, Hungary has Boar’s Blood? Although quite tasty, there is more to Hungary than Goulash. For one, there is a huge wine production, but this isn’t new. And neither is the communication of Hungarian wine, still referred to as boar’s blood, or at least blended wines. In the U.S. we typically hear the same blends referred to as “table wine”, “Meritage”, or “Bordeaux blend”. Historically, wine has been the favored choice over water for hydration, so it’s no surprise that the 3,000 Celtic people who lived in Hungary made wine. Most of the Hungary-wine produced was white, at least before the mid-19th century. In fact, 1686 marked the time when the Turks left and Bosnia monks arrived. German-speaking settlers brought white grapes, but over time, the Serbs switched to red. To put things in perspective on Hungarian wines and their prestige, know this…Queen Elizabeth drinks Cabernet Sauvignon from Villany. I found this out while on an AMA Waterways River Cruise from Budapest to Bucharest. Tasting in Villany, I had the great pleasure to taste foreign wines in a cave. The first chardonnay comes from a village outside of Villany. This white wine was a favorite of mine —un-oaked and made in stainless-steel tanks. Wine tasting in Villany surprised me, with its 22 historical wine-producing regions. These fun facts satiated my curiosity almost as much as the wines tantalized my palate. For instance, in the northern region of Hungary, the Tokaj wines are made from white grapes discovered by the French King… from a 15-million-year-old leaf! Yes, the history of wine production is long in Hungary. I hadn’t known that the second best known wines hail from nearby Belgrade, Serbia, and that in the 19th century, the Phylloxera outbreak left the majority of vineyards dead. From the point of re-planting, red grapes began to grow in this area…Oporto to be exact, which is the Portuguese wine in Villany. When the Turks tried to seize Hungary for 25 days, the Hungarians thought they were gonners – they could live or die. So, on their last day, they were happy when their women brought good red wine from the cellars, from barrels to buckets. The Turks saw the wine trickling down on the Hungarian beards and white shirts. These Hungarians drank too much, and as a result, felt strong — strong enough to fight. The Turks thought they drank boar’s blood and they ran away. Moral of this story: drink wine in fight or flight. While tasting, I discovered the 2014 rose would have tasted best mixed with soda water. With an aroma of strawberries and its coppery rose color, this wine seemed to have gone into secondary fermentation – a bit fizzy. It’s blend of 3 sources, including blue cabernet franc and cabernet sauvignon did not impress. Finally I tasted the first of four reds, a ruby color that made me feel regal. It had a faint aroma of currants, a very good tannin structure and medium finish. It proved a medium to light bodied wine, “real blood of Villany Hills” — an Oporto from 2013. The second red – again a ruby color – offered a deeper berry aroma and still light, definitely a pinot noir. It was an enjoyable medium bodied wine, a 2011 blue francish with 14% alcohol, originally from Austrian region – Nazi days – when payment was made with blue francs. Our third wine had the same ruby color – with high alcohol and low acidity – so its shelf-life is less. I got the aroma of a band-aid and obviously disliked this 2011 blend of 40% Oporto, 40% blue francish – seed of sour cherry – and 20% cabernet sauvignon. Here’s toasting to Attila the Hun and history. Life in Northern California offers endless opportunities for day trips and weekend visits to explore small coastal towns or big cities like San Francisco. So, I spent a night in San Francisco following a short visit to a friend’s house in Sacramento. The first thing I did was relax with a glass of Magnolia Grove 2013 California Cabernet Sauvignon. Magnolia Grove 2013 California Sauvignon, priced at just under $10 a bottle. 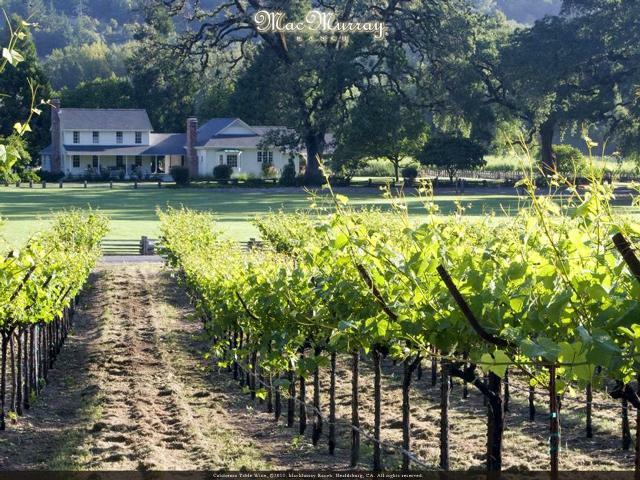 This wine is an average, well-priced garnet-toned Cabernet made from grapes of Sonoma County. I wouldn’t complain about it – it was tasty! — but there really wasn’t anything complex about it. For my palate, this is a drink-alone, medium bodied, great all-around table wine. The Magnolia Grove of Chateau St. Jean would be the perfect spot to sip this berry and cherry-flavored wine. Although I was not in Sonoma when I drank it, I was enjoying my first experience exploring San Francisco. This bottle of Magnolia Grove was left as a gift during my stay at the Palace Hotel, A Luxury Collection Hotel. This was the start of channeling my inner queen. My room at the Palace Hotel, which, by the way, was originally built in 1875, was so inviting, especially after a long evening enjoying the company of good friends and perhaps too much wine the previous night. I would have been perfectly happy to crawl under the crisp, clean sheets and watch the big screen TV and sip wine paired with Cowgirl cheese and crackers. But…I was in San Francisco for only one evening, so the plan was to explore the dining scene. I had already spent the afternoon in Fisherman’s Wharf, which was amazing if only to watch the seals compete for space to sun on the dock. I wasn’t hungry, but if I were, it would have been a great place to select any number of culinary delights — from seafood to burgers and chowder, and lest not forget See’s Candies or Ghirardelli Square, the latter a stone’s throw from the area. I can now say that I rode the cable car in San Francisco, and I live to tell the tale. I had no idea it would be so thrilling, and quite similar to a roller coaster in that you creep uphill in a struggle; fortunately you do not coast downhill, but it is a steep slope and the struggle of the car to keep a slow speed conjured up thoughts of broken cables and a runaway car from movies and televisions shows I’ve seen. Now that I’ve done it, I don’t need to do it again. My day was full, I was tired, and when I stepped into the Palace Hotel, I wanted to remain there for a few days…at least. Why wouldn’t I? The lobby entrance was palatial, keeping in line with the theme of ornate interior design. Inside my modest, but very comfortable room, a toilet with options! A warm spritz later, I was out on the town — to Telegraph Hill to enjoy an Italian dinner at Original Joe’s in North Beach, with the Rat Pack overhead. Before I knew it, my virtual crown was left behind and I was on the rode again. San Francisco, I’ll be back soon! Hold the mustard… not! You’ll want to taste plenty of varieties in Dijon, where the TGV arrived early one morning to drop me off to a place where some of the world’s best mustard is produced and sold. In Dijon, mustard is everywhere and in all colors and flavors. It is here where I purchase a jar of mustard blended with Modena balsamic vinegar to bring home for a later indulgence. Once tasted, it proved worthy of another train ride to get more of this specialty to the Burgundy region of France. Famous for its Dijon mustard, which originated in 1856, we can give thanks to Jean Naigeon, who substituted the green acidic juice of unripe grapes for vinegar, introducing the tasty and traditional recipe. 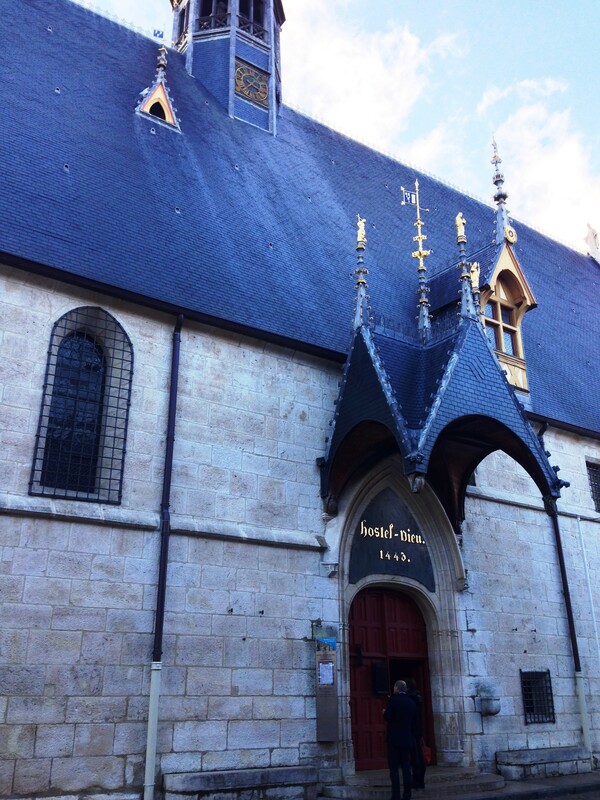 Aside from mustard, Dijon offers a city of history, and I partake in a brief walking tour offered by the Dijon Tourism Office to shed some light on the small area’s historical background. From Notre Dame to the Romanesque Dijon Cathedral to the Rue des Forges and Maison Milliere, I stroll along the cobblestone streets in awe of this quaint city in Eastern France. What brought me to Dijon, however, was not the mustard, or the “Kir” Dijon is known for – also known as crème de cassis, but the annual International and Gastronomic Fair, where over 500 exhibitors and 200,000 visitors flock for a taste of the region’s specialties. 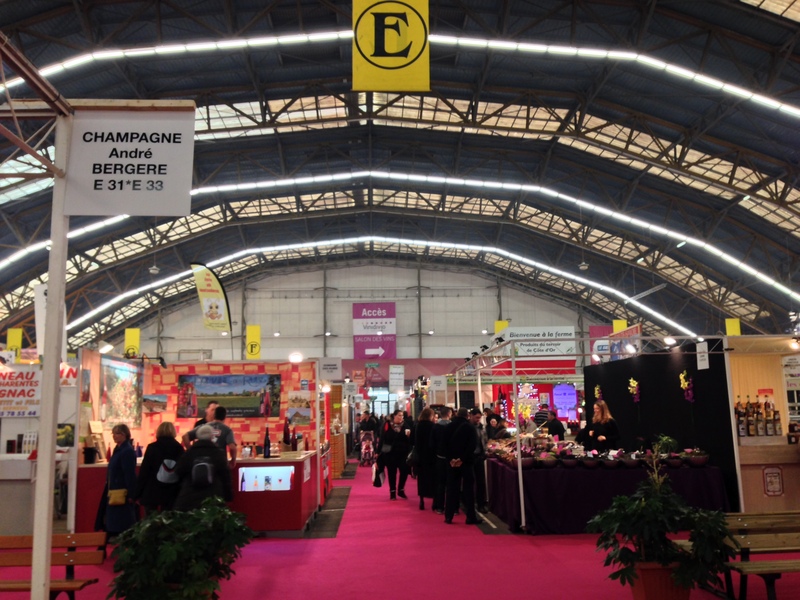 So, I hopped on a tram to arrive at the amazing Foire Gastronomique. Champagne is poured for a price, so I decide to sip an A. Bergere Champagne and sample Comte cheeses and more culinary delights, including escargot marinated in butter and seasoned with garlic and parsley. An order of pomme frites paired well with the Champagne as I strolled along the aisles holding the French specialty served in a paper cone. A quick tram ride to the train station later, I’m headed to Beaune. The Hospices of Beaune, established in 1443 by chancellor to the Duke of Burgundy – Nicolas Rolin and his wife, Guigone de Salins. Google Mapping my way to the historic monument, the Hospices, I learn this is where some of the priciest wines are sold via a well-known wine auction. Although I didn’t have the opportunity to taste these wines, I did get a taste of the infirmary where, coincidentally, a woman in our small group fell ill. As I strolled through the “palace for the poor,” established in 1443 by chancellor to the Duke of Burgundy – Nicolas Rolin and his wife, Guigone de Salins – and listened on the audio-guide, I couldn’t help but wonder how the nuns would have taken care of my friend. I could almost see her lying in one of the many rows of beds. Fortunately, the pharmacies of France proved knowledgeable and within an hour of taking a recommended dose of a magic pill, the cheese-overindulgence side effects were a mere memory. Off to the next stop, I ponder over the fact that the United States spends the most dollars on Burgundy wines of France, with the U.K. holding second place. In 2011 alone, 199 million bottles were sold, with the majority being white wine — mostly Chardonnay. So, why are Burgundian red wines so special? Apparently, these wines are what they are due to their terroir, and some of the most expensive wines in the world come from this region of France. If you like pinot noir, these wines will send you swooning. They differ from American pinot noir grapes in that the Burgundian grapes are more fruit-forward, but they all pair well with savory, less spicy dishes. To learn more, I stopped at Vins des Tonneliers, a distributer in Beaune that offers more than 500 Burgundy appellations selected carefully and personally from 52 family-run domains located in the Côte de Nuits and Côte de Beaune vineyards, the latter most famous for its white grand cru. With a few friends in tow, we tasted some local amuses-bouches and several rare wines made in small quantities from this distributor’s chilly wine cellar named La Vinif. One Thursday each month, La Vinif offers “Thursday Aperitifs,” focusing on different themes and entertainment (visit Facebook page La Vinif – for members only). Customized service is what the Vins des Tonneliers offers, so for corporate events and parties, you can make an appointment for a full tasting, and this means with appetizers, to select the bottles of choice. Vins des Tonneliers will also help you with wine menus, corporate gifts, training, customer events, distribution and team-building seminars. The benefits of being a member of this organization include phone advice to those seeking wine pairing or wine-opening decisions on aging bottles, personalized notifications, occasional discounts, and access to private sales (membership fee is 150 euros/year). I walked out learning that dependent upon weather conditions, a white wine can be stored for 5 to 7 years, and a red for 8 to 10 years. I tasted an elegant chardonnay without a label, produced by a viticulturist, and a Pernand-Vergelesses ($25) that offered a clean, fresh minerality pairing nicely with cheese, fish, white meat – as an aperitif, and a puligne made from a wine merchant. As for the reds, a Pierre Bouchard 2011 Cote de Nuits-Villages ($17) offered licorice aroma and a spicy, young, delicious taste or raspberries and more red fruits, and a 2009 Domaine J.M. Boillet that isn’t titled as a grand cru – but it should be. This particular wine can be stored until 2024. 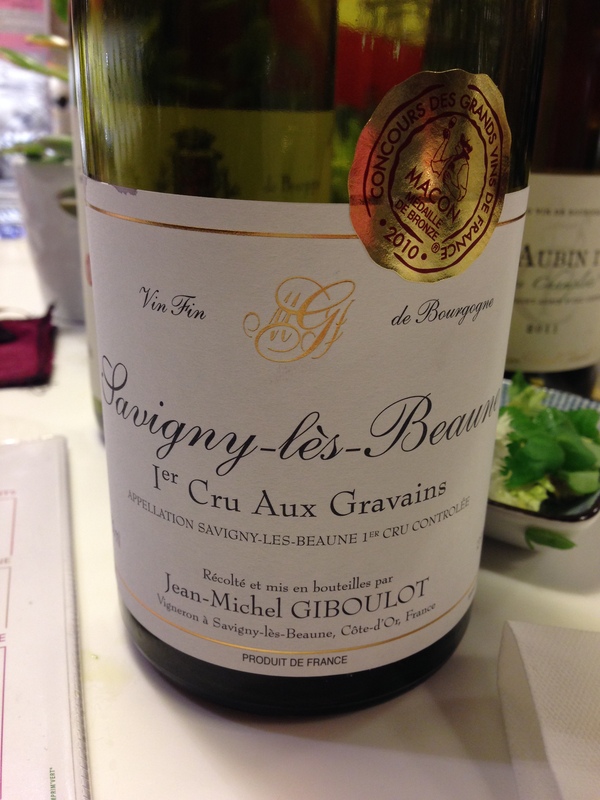 I also walked out with a bottle of 2008 Savigny-les-Beaune first grand cru “Aux Gravains” rouge that proved black current-forward when I tasted it, and opened it almost two months later for a special dinner of oysters, escargot and various French cheeses; it was a medium-bodied, flavorful pinot noir. 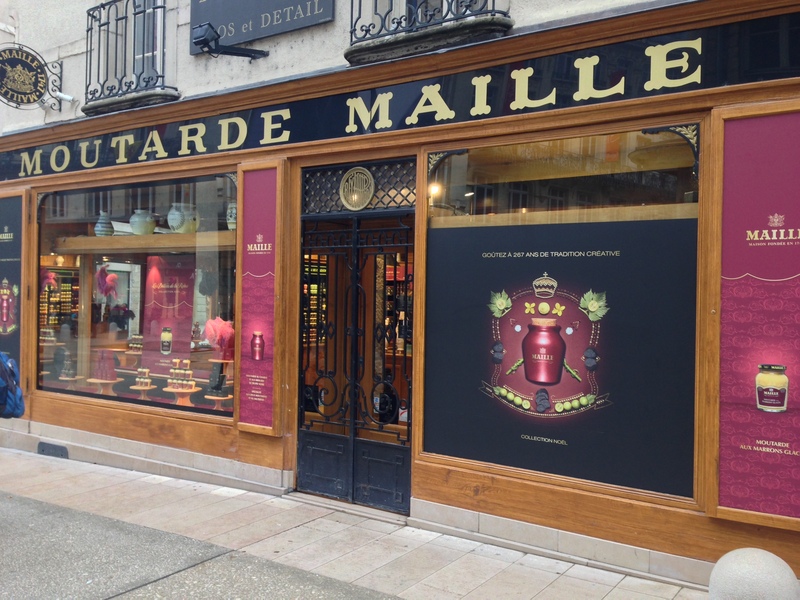 By 10 p.m. same day, I was back in Paris, satiated with wine tastings that paired well with adventure, and I now had a flavor of Dijon and Beaune, a destination I’d head back to for an overnight visit to sip and explore the various wine shops, bars and wineries in the walk-able circle. I also developed a strong thirst to return to Burgundy for a visit to the elusive Romanee-Conti, where one of the most expensive wine labels in the world is produced.